A mismatched pair of socks. The definition of mismatch is something that was not correctly paired. An example of a mismatch is two people on a date who do not get along. Mismatch is defined as for things that are similar to not be put together correctly. 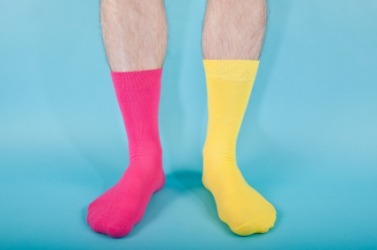 An example of mismatch is to incorrectly sort two pairs of socks. "mismatch." YourDictionary, n.d. Web. 18 April 2019. <https://www.yourdictionary.com/MISMATCH>. Something that does not match; something dissimilar, inappropriate or unsuitable. As a result, the manufacturer has a mismatch of various ensemble pieces and can no longer supply complete ongoing ensembles. In the romance department, Virgo's libido is slightly less dynamic that that of Gemini, and this can lead to another mismatch of energies.